The anodized aluminum shell feels very well built and is remarkably light. So much so that our first instinct was to ask whether the battery was inside or this was just a hollow mockup. We’d compare it to the feeling of picking up the Zune HD for the first time, it’s a strikingly light device. Plopping it into our pocket also felt extremely natural, which might be attributable to the particular curvature of the N8’s sides. 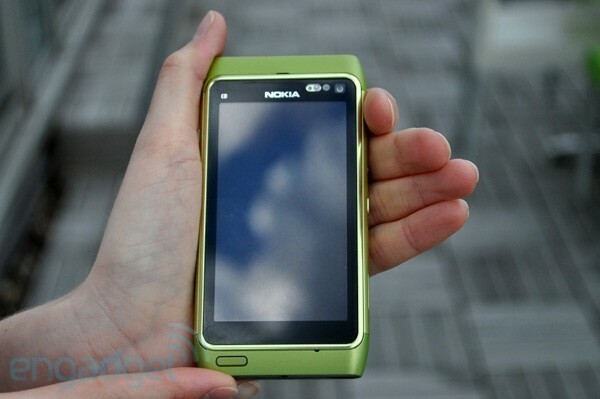 Please be sure to read the full post at Engadget for the the Nokia N8 Hands-On. 128diggsdiggGood old London, full of little wonders and flagship devices for you to discover. We were at Nokia’s local HQ this morning to talk to the company’s Head of Design Marko Ahtisaari, and the good gent happened to bring with him a prototype N8 for us to play around with. It was stressed to us that it’s a prototype, so small cosmetic changes might still occur, but we are for most part looking at the hardware that will be hitting retail shelves in Q3 of this year. Speaking of Q3, Marko was adamant that that will be when Nokia “turns on” the Symbian 3 housed within the N8, which — disappointingly — meant that we couldn’t get to grips with the new UI experience in person. Ah well, there are plenty of pictures to be devoured in the gallery below, and we can provide you with a few observations of our own to tide you over till then.